Super Strong Double Wall wardrobe boxes are ideal for moving or storing your clothes. 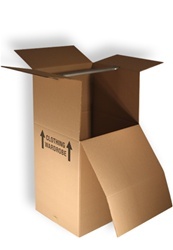 Made from heavy duty paper these boxes are reusable and easily fold down for storage. We sell industry standard Large Wardrobe boxes. Includes 24" Bar. 24" x 21" x 47".